Are you checking Edogawa City Rinkai Ball Park? The Rinkai Ball Park is a sports ground on a vast roof top of a very large-scaled water supply facility. This Park consists of baseball grounds for boys and girls, multipurpose grounds, and futsal courts. Games, such as baseball, football, rugby, lacrosse and futsal, are held here. This park is located near to Tokyo Bay, and you can feel a smell of salt. 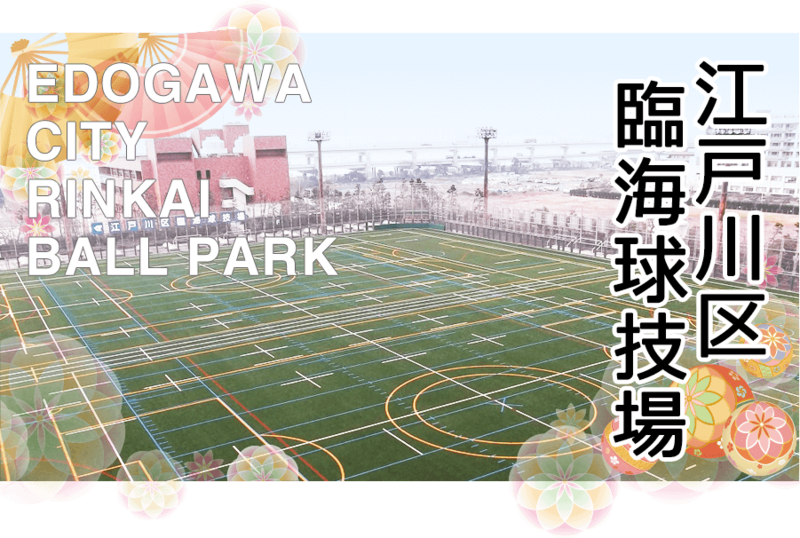 ○ Would you like to take a walk to the Edogawa City Rinkai Ball Park? From Nishi-Kasai Station, if you walk about two miles along “Seishin Rinkai Fureai Ryokudo (Seishin Rinkai Friendly Green Way),” you can get to a viewpoint where you can command a view of Tokyo Bay. This is a road preferential for the pedestrians. Please enjoy walking leisurely. Please use a stairway to come up to the Park. There is an outdoor rest house with the orange-color roof, and you can buy drinks from a vending machine. Please be sure to drop in the Park for a coffee break while walking to Tokyo Bay.